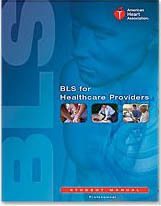 The B LS for Healthcare Providers Reference Manual covers BLS adult and pediatric CPR (including two-rescuer scenarios and use of the bag mask), foreign-body airway obstruction and the AED. Includes pediatric module with recommended guidelines concerning the use of AEDs on children. 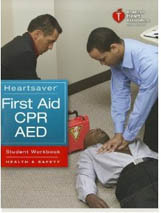 Also includes supplemental information on topics such as stroke, cardiac arrest, and special resuscitation situations. The Heartsaver First Aid with CPR & AED Reference Manual covers general First Aid Principles, Medical Emergencies and Injury Emergencies) also covers topis on Environmental Emergencies and CPR & AED. Learn to manage illness and injuries until professional help arrives. Includes a CD containing supplemental first aid information. Intended for those who have a duty to respond to a first aid emergency because of job responsibilities or regulatory requirements. Specially designed to be used by the professional rescuer and first responder. It offers superior protection for both rescuer and victim. 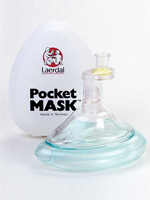 The Laerdal Pocket Mask combines a low resistance one-way valve with a disposable hydrophobic filter to help prevent the passage of liquids and secretions.